As a pre-event to ADB Transport Forum in Manila, Philippines, the interdisciplinary Expert Group on Promoting Climate Finance for Sustainable Transport held its first formal meeting. Learn more about the interdisciplinary Expert Group, download the final report of the meeting, presentations and next steps. The TRANSfer project has initiated activities to promote the uptake of the use of climate finance in sustainable transport. 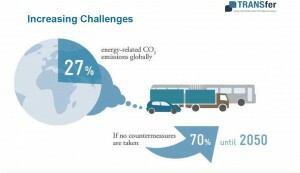 The objective is to help ensure that climate finance is increasingly used for sustainable transport in an effective way to realize the large GHG emission reduction potential in the sector. To do that, there is a need for an increased mutual understanding between actors active in the areas of climate and transport finance. c) Identifying and making use of ways to address climate finance experts and institutionsand the transport community and disseminating the outputs of a) and b). Learn more about Transport NAMAs through our Transport NAMA Database!